Jared's career in the New Zealand film industry started in 1993, but his big break into feature films came with a role as one of the key location managers on The Lord of the Rings in 1999. What followed has been numerous big budget projects, including King Kong, 10,000 BC, The Lovely Bones, The Chronicles of Narnia: Voyage of the Dawn Treader and, as Supervising Location Manager, The Hobbit trilogy. Can you tell us about your professional background and what you do? "After 23 years of location scouting and managing, I've recently decided to set myself a new challenge, taking a step up into the role of Production Management on the film Mortal Engines, which we filmed here in Wellington at Stone Street Studios during 2017. It was a great experience, and I relied a lot upon the skills I had developed as a Location Manager over the past two decades, budgeting, operational issues, crew management and so much more." Jared talking location specifics with Andy Serkis, 2nd Unit Director of The Hobbit - An Unexpected Journey. "I haven’t quite hung up my boots yet when it comes to working in the Locations Department, as the knowledge I've gathered is still an asset that I love being able to share with not only the industry, but also friends and colleagues who may be travelling on their own personal adventures across the country. I often receive emails from people I know who have somebody close to them travelling to NZ, and they want to know where I might suggest they head to capture a truly unique experience of what NZ has to offer them on their journey." Jared on the set of The Light Between Oceans. Does a location scout/manager require an extensive knowledge of the country in which he or she is working, or just really good research skills and networks? "It’s definitely foremost in the minds of all locations scouts that both aspects are crucial to fulfilling their role on a film project. All the knowledge you gather while scouting over the years, and even when not at work, is your asset, and you need to be able to have that asset stored in a manageable format (whether that’s mental or physical) so you can tap into it at a moment’s notice and share that information with the creative team on your project." Having a helicopter at your disposal certainly helps to record and store those visual assets! "However, to capture that extensive knowledge of the country, you need to be able to research and communicate across multiple networks, which is a skill set you need to always keep honing. Both aspects complement each other and are crucial to being a good location scout. Having an intimate knowledge of the country is important, but often you may need to enter a part of the country you have never visited, or be asked to find something you've never had to look for before, which is when your ability to communicate with people, seek help, and undertake effective research is crucial to being able to provide the right locations for the project." What were the location challenges around the filming of River Queen? "Ba ha ha ha…. How long have you got? This was probably one of the most challenging projects I have ever undertaken. The entire film was shot on location, and often in remote wilderness areas. We had to find locations that not only looked like there had been no modern developments on them, but were also accessible and easily serviced by a film crew. All on shoe string budget." The movie's two main characters Sarah (Samantha Morton) and the Maori warrior Wiremu (Kiwi actor Cliff Curtis) travelling up the Whanganui River where most of the movie was shot. "There were numerous political issues as permissions were required from a broad range of iwi groups in the region, who often had differing opinions and objectives when it came time for us to secure permissions from them. No single meeting or application was ever the same, even though the permissions all related to the same filming locations and scenes. We ended up having to shoot the film during winter, so the cast were often subject to some very trying conditions, which placed an increased workload on the crew." 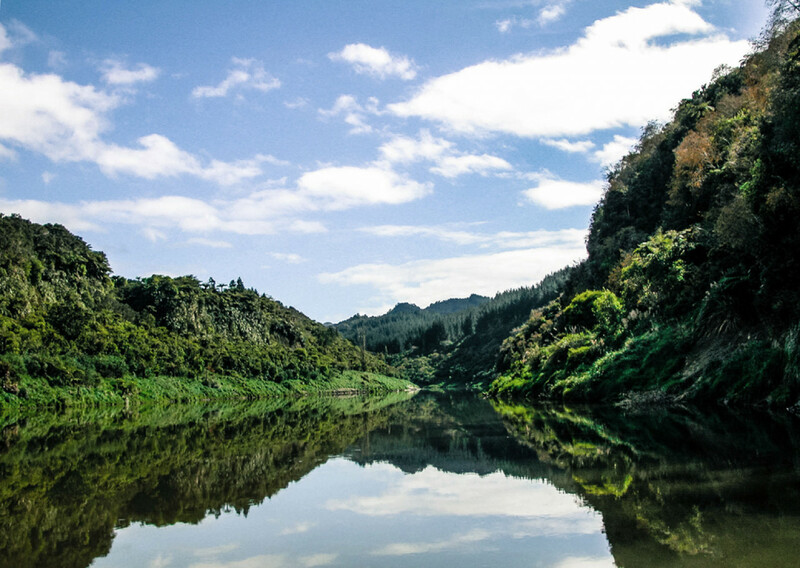 The Whanganui River has been given the status of a legal entity. "Then the Director was fired, and that’s when things really started to get interesting….. to say this project was a challenge is complete understatement. However, we were filming in some of New Zealand's most amazing locations throughout the Central North Island, and to this day I'm still in touch with a lot of the landowners and locals from the project. Those incredible shared experiences on the film helped form bonds of trust and respect that are vital for the film industry to have when it comes to filming on location here." What was involved in finding the locations for the movie The Light Between Oceans? "The Light Between Oceans came as a bit of surprise really as the story was set in Australia and the producers had undertaken an extensive scout of the continent long before they contacted me here in New Zealand. They weren’t able to find a lighthouse location in Australia that was readily available for their filming schedule and matched the look required for the story. With the film being based on a popular book, and the lighthouse being central to the story, it had to have the exact setting for it all to work - ensuring the audience (most of whom would have read the book) believed that the filmmakers were treating the original story with the respect and care they felt it deserved. Authenticity was a core principle for the project." "So, we began our search of the country, top to bottom, every lighthouse we could research in advance of the scout was exhausted to its fullest extent. Before we could head off in search of the perfect location, we needed to understand the numerous logistical issues they all presented. The mere nature of a lighthouse is often isolated and inaccessible…. Not exactly ideal for a film crew." "After numerous trips by both helicopter and car, up and down the country, we narrowed it down to a handful of options that we could realistically present as options to our Director. When we finally reached Cape Campbell, and he stared out across the headland and saw the opposing swells crashing against each other, he knew instantly that he was standing in the right location for the film. It was a long hard journey, but Cape Campbell proved to be the ideal location for us. So, with the help of the land owners, and the Marine Safety Authority (yes it was a fully functioning lighthouse) we set forth on an unforgettable journey of transporting the lighthouse and surrounding buildings back in time to the 1920’s." Tom and Isabel in front of the cottage (film scene). The interior was left intact after filming was finished and visitors can now stay in Tom and Isabel's cottage. "However, the Lighthouse was only one part of the story and we needed a number of other authentic locations to capture the essence of our Director’s vision. We looked to Dunedin for its wealth of historic homes and period architecture that had been so lovingly retained and restored over the past century. The church in Warrington was ideal with its perfectly positioned cemetery. Fletcher House in Broad Bay was a museum piece in itself and our Production Designer was very pleased we were able to secure permission to film on the property and also utilise its amazing furniture and decorations. Port Chalmers was the seaside village that opened its arms up to us, allowing us to close the main street, dress the roads with gravel, and turn their shopfronts into what was an authentic 1920's scene in Australia." 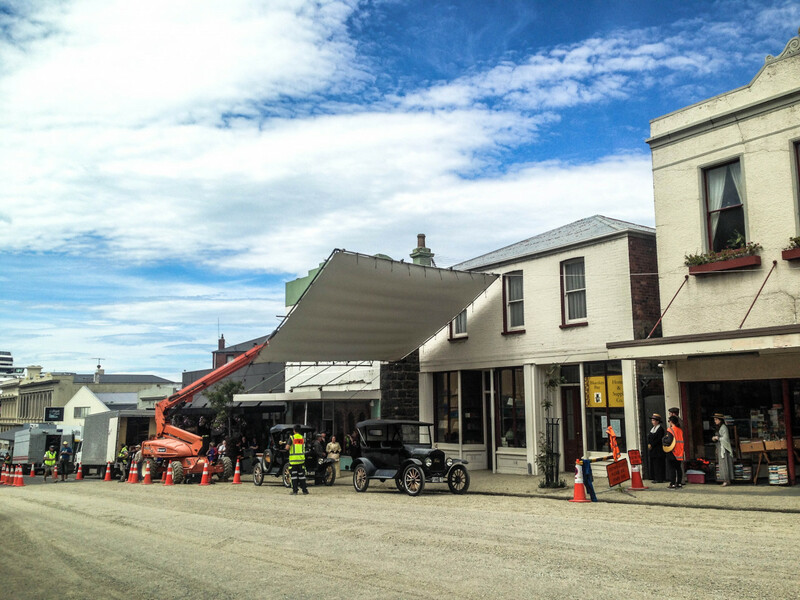 The main street of Port Chalmers during filming. "It's these kinds of experiences that are so incredibly unique not only for the film crew, but also the locals who we work with. It's often hard work, and never easy asking people to disrupt their normal daily routines entirely, but it's always such a rich and rewarding experience for everybody, which is why I've always loved location scouting and managing in film." You location managed all three LOTR and Hobbit films. Can you talk about the most challenging and rewarding aspects of the process and what your favourite LOTR and Hobbit locations are? "The most rewarding aspect of working on both LOTR and The Hobbit film trilogies was the profound effect the films had on the world, and knowing that I played a role in helping bring those stories to the screen for everybody to enjoy. It was LOTR that launched my career in feature films and provided me with such an amazing experience to build from in the years to come. However, returning for The Hobbit, ten years later was an absolute honour and privilege to once again help build Middle Earth with Peter Jackson." Thorin Oakenshield and his companions are chased by a pack of orc hunters. Pelorus River near Nelson, New Zealand. The location was used for the scene where Bilbo and the dwarves float down the Forest River in wooden barrels. "On The Lord of the Rings my favourite location would have been Mt Ruapehu. It was my first real large-scale location that I had to manage and was such a hugely logistical and political challenge that I relished every moment of it. We filmed in so many different areas around the National Park, with three different film crews all at once. When a snow storm ripped through, crushing our marquees and shutting the filming down, we had to react quickly and extract ourselves to the lower slopes so we could keep on shooting. Filming there I made close friends with so many of the locals, some who still work with me today as my most trusted colleagues. I will forever have a very close relationship with the mountain and the region." Mount Ruapehu is an active strato-volcano. The highest peak stands at 2,797 metres. 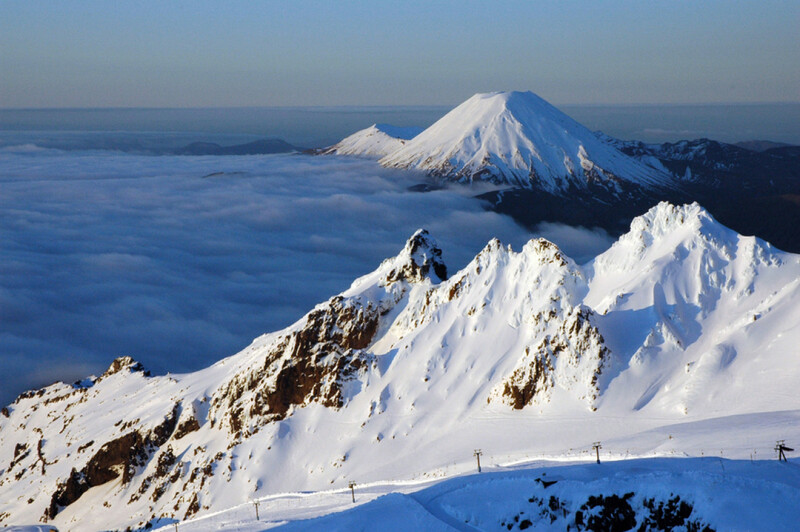 The image above shows the Whakapapa skifield on the northern slopes of the mountain. The picture-perfect cone in the distance belongs to Mount Ngauruhoe. On the southern side of Mount Ruapehu is the location where Gollum tries to catch some juicy fish in The Lord of the Rings - The Two Towers. 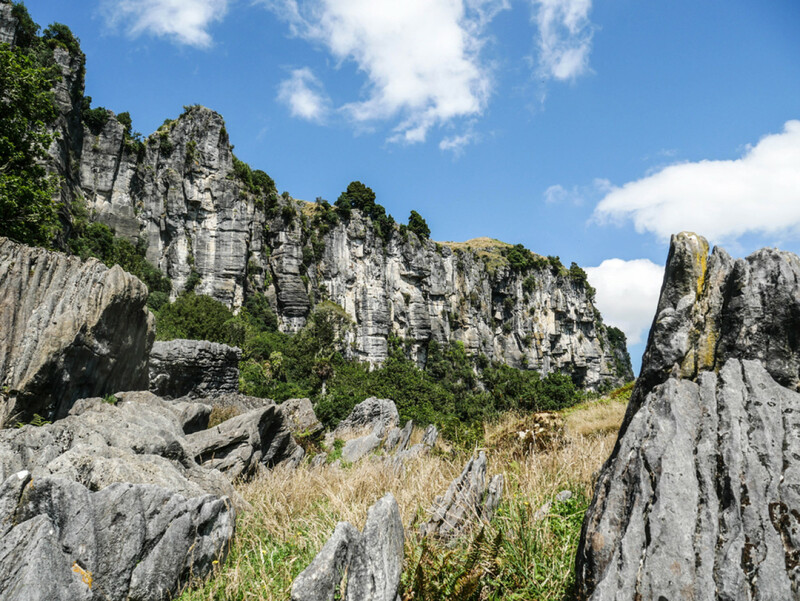 "On The Hobbit my favourite location by far was at the Denize family farm, in the Waitomo region. It was the first location that Peter chose for the film, and we spent many, many months preparing the area for the shoot. We built a kilometer-long access road up the steep King Country hills, into the heart of the farm, and at the base of the towering Limestone Bluffs which attracted us to the property." The massive base camp at the Denize farm in Waitomo. The helicopter for the aerial filming was flown by Alfie Speight from Glacier Southern Lakes Helicopters, who is one of the world's most experienced pilots in this field. "We also had to close the paddocks off from stock and let the grasses grow wild for 8 months to give it that 'Middle Earth' look. It was a project where my team and I could flex our logistical muscles across all aspects of the filming requirements. We had a lot of fun here and again, I totally connected with the community and region so much that I'm always looking for excuses to return and shoot here." The limestone bluffs above the Denize family farm play a promintent role in An Unexpected Journey. Suzie Denize now runs location tours for fans who come from all over the world. You worked on Ghost in the Shell: How do you see the impact of CGI on the authenticity of locations in movies? "CGI is an amazing tool and it has certainly allowed filmmakers to create worlds and tell stories that literally weren’t possible a few decades ago. At the end of the day though, enhancing a filming location with CGI is the same concept as dressing a location or building an amazing film set on a location, except its digital!" Wellington's Victoria Street was one of the few real locations used in Ghost in the Shell but it first had to be converted into a Hong Kong-style road. "Of course visiting a location that’s been heavily enhanced in a film makes it hard to relate to, but the filmmakers are there to make a film, not create a tourism product (sorry that might not be a useable line for you, but it’s my honest opinion). There are so many stories to tell on film, some require locations, some require studios, some require CGI, they're all just elements in the filmmaking process and I personally think CGI enhancement of locations is fantastic. Seeing your location photos being worked on by concept artists, as they build and create and enhance whole new layers across a shot is a very exciting process to be a part of. I'd often share 'before' and 'after' images with the location owners to help get them engaged with the project and the director’s vision." Some of the masks created for Ghost in the Shell are on public display at the Weta Cave in Wellington, New Zealand. Are there any locations in NZ you've found that haven't yet made it onto the big screen (but you wished they had)? "More so a region than an actual location. Northland is a very under-utilised part of the country for filming and yet it has some of the most amazing locations available in New Zealand. Around the Bay of Islands, not only are the islands stunning, but the beaches all around that coastline are some of the most unique and beautiful locations you could ever imagine. I've had a few projects over the years consider the region, but we've never landed anything significant." One of the many beaches in Northland. "My personal favourite is this amazing little headland and rocky coastline around Rawene, dramatic cliffs and amazing views up along the northern side of Cape Brett, and all only a short drive from Russell." What was your best location find ever? "I always remember discovering Wharariki Beach (top of the West Coast - South Island) by complete accident. I had no idea anywhere like it existed in NZ. It wasn’t until I went for a heli scout along the coastline for The Lovely Bones that I stumbled across it. The arched rocks positioned so beautifully in the bay, with such a deceptive scale is something I'll never forget the first time I flew around them." Wharariki Beach and Archway Islands. 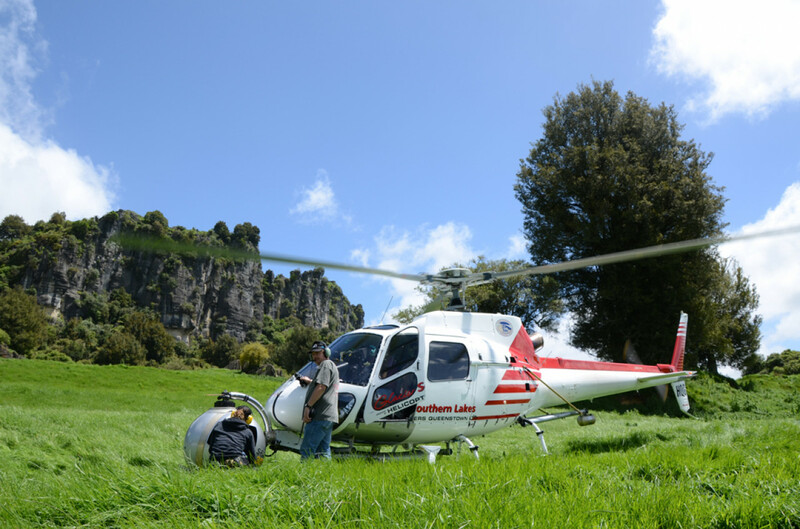 "Landing a helicopter alongside the sea caves and exploring the numerous limestone tunnels and outcrops is something that I often try to get filmmakers to experience if they're ever in the region. It’s such an inspiring place to visit due to its isolation, and no matter how many times I visit, I always come away humbled by our country's diversity and raw beauty."